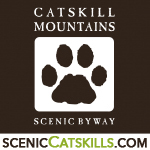 up to the trailhead for the tallest peak in the Catskill Mountains! Consider a twenty-mile scenic side trip that flanks the winding headwaters of the world-famous Esopus Creek up to the trailhead for the tallest peak in the Catskill Mountains! From the hamlet of Big Indian, head south along Ulster County Route 47 (also called Oliverea Road or Frost Valley Road) for an adventure into the serene and picturesque Big Indian–Oliverea Valley. This rural road passes by several places where you can test your endurance by taking a hike in the dense forest preserve or can simply provide an enjoyable drive in any season as you gaze up at steep, tree-covered mountainsides and summits. Between Big Indian and the trailhead for Slide Mountain, you’ll ascend 1,500 feet in elevation in just over nine miles. Initially, the Esopus Creek valley is rather wide and you’ll see the clear, tree-shrouded creek “snaking” back and forth from one valley wall to the other over the first four miles. Then, during the last five miles, you’ll catch only glimpses of the now cascading, tumbling creek as it continues to carve its way down through the Catskills bedrock as it has done for many millions of years. Expect broad, sweeping views throughout this trip, both up at mountain ranges and across the valley. At least six deep, dead-end “hollows” penetrate into the footprint of these massive mountains with such names as Panther, Balsam, Eagle, Fir, and Big Indian Mountains. Several of these hollows contain access points and parking, such as Lost Clove, McKenley, and Burnham Hollows. Others, such as Hatchery, Little Peck, and Maben Hollows contain nearly all private lands. Giant Ledge, the most notable trailhead in the valley is located on a “horseshoe curve” 7.5 miles from Route 28. A short (1.75-mile), but steep hike leads to an incredible view over the eastern Catskills. From here, your drive up over the mountain pass steepens for one mile until you pass Winnisook Lake (private) on your left. This high-mountain “lake” is considered the headwaters for the Esopus Creek. A rocky shoulder of Slide Mountain forms a magnificent backdrop. In another one mile (9.4 miles from Big Indian), you will see the trailhead for 4,180-foot-tall Slide Mountain on your left. Enjoy!